The Crowley, Louisiana 1930 census shows that Josephine married a Moses and it appears that they had twins. The census is very hard to make out. I was informed later after making contact with the Senegal relatives in California that Cleo and Theo were the twin's names. I finally found them!! - R. Finley Sr.
[S-2137537696] 1910 United States Federal Census, Ancestry.com, (Online publication - Provo, UT, USA: The Generations Network, Inc., 2006. For details on the contents of the film numbers, visit the following NARA web page: NARA.Original data - United States of America, Bureau of the Census. 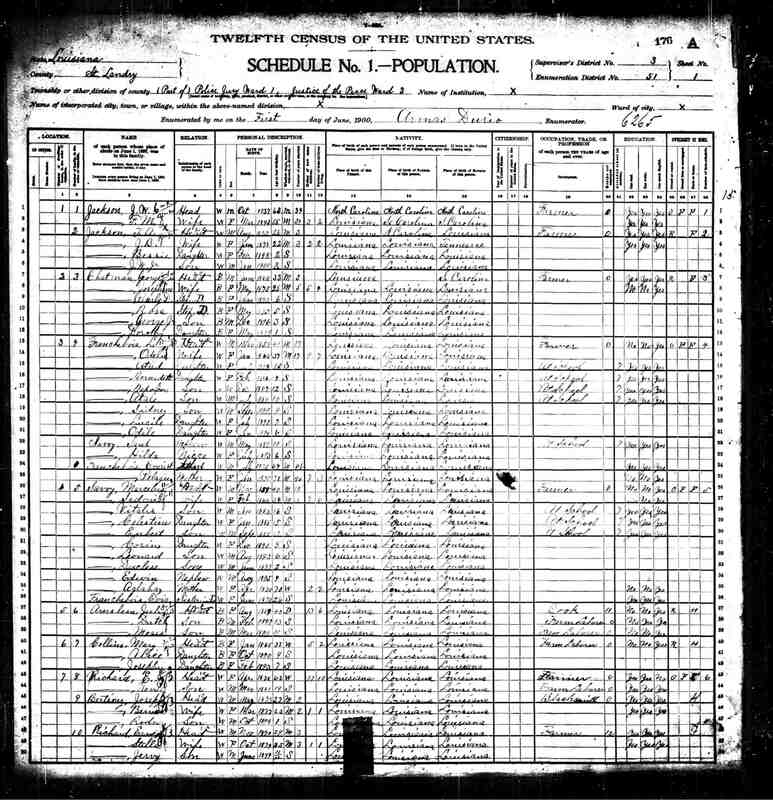 Thirteenth Census of the Unit), Year: 1910; Census Place: Crowley Ward 3, Acadia, Louisiana; Roll: T624_507; Page: 34A; Enumeration District: 10; Image: 650. [S-2137537704] Social Security Death Index, Ancestry.com, (Online publication - Provo, UT, USA: The Generations Network, Inc., 2009.Original data - Social Security Administration. Social Security Death Index, Master File. Social Security Administration.Original data: Social Security Administration. Social Security), Number: 561-36-8667; Issue State: California; Issue Date: Before 1951. [S-2146577889] United States Obituary Collection, Ancestry.com, (Online publication - Provo, UT, USA: The Generations Network, Inc., 2006.Original data - See newspaper information provided with each entry.Original data: See newspaper information provided with each entry. ), Newspaper: Oakland Tribune, The; Publication Date: 19 Apr 2004; Publication Place: Oakland , CA , Us. [S-2138647634] 1930 United States Federal Census, Ancestry.com, (Online publication - Provo, UT, USA: The Generations Network, Inc., 2002.Original data - United States of America, Bureau of the Census. Fifteenth Census of the United States, 1930. Washington, D.C.: National Archives and Records Administration, 1930. 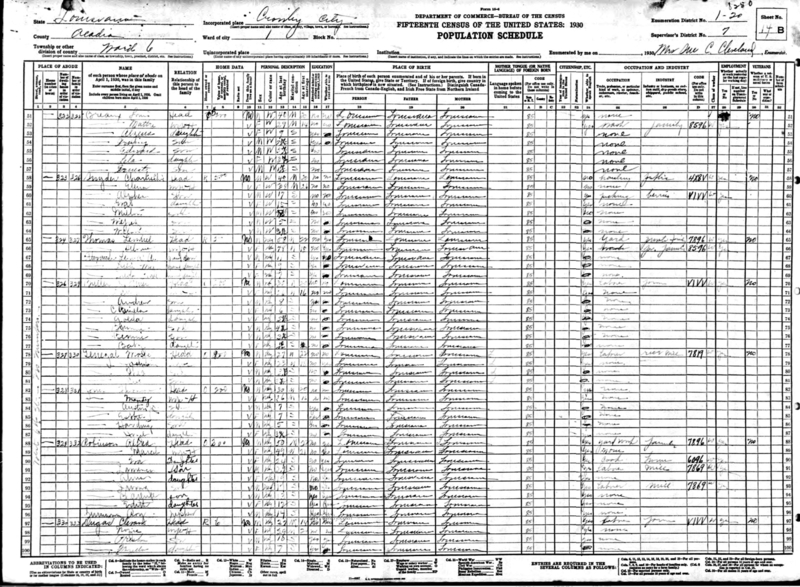 T626), Year: 1930; Census Place: Crowley, Acadia, Louisiana; Roll: 782; Page: 14B; Enumeration District: 20; Image: 585.0. [S-1796124507] Web: Obituary Daily Times Index, 1995-2011, Ancestry.com, (Online publication - Provo, UT, USA: Ancestry.com Operations, Inc., 2012.Original data - The Obituary Daily Times. The Obituary Daily Times. http://www.rootsweb.ancestry.com/~obituary.Original data: The Obituary Daily Times. The Obituary Daily Times. http:). [S-1794821557] 1940 United States Federal Census, Ancestry.com, (Online publication - Provo, UT, USA: Ancestry.com Operations, Inc., 2012.Original data - United States of America, Bureau of the Census. Sixteenth Census of the United States, 1940. Washington, D.C.: National Archives and Records Administration, 1940. T627), Year: 1940; Census Place: Crowley, Acadia, Louisiana; Roll: T627_1378; Page: 23B; Enumeration District: 1-23. [S-1034759064] Global, Find A Grave Index for Burials at Sea and other Select Burial Locations, 1300s-Current, Ancestry.com, (Ancestry.com Operations, Inc.).  [S-2134050168] Ancestry.com, (Ancestry.com), http://www.familyoriginstree.com/custom_images/census_page2.jpg, Jan 1920. 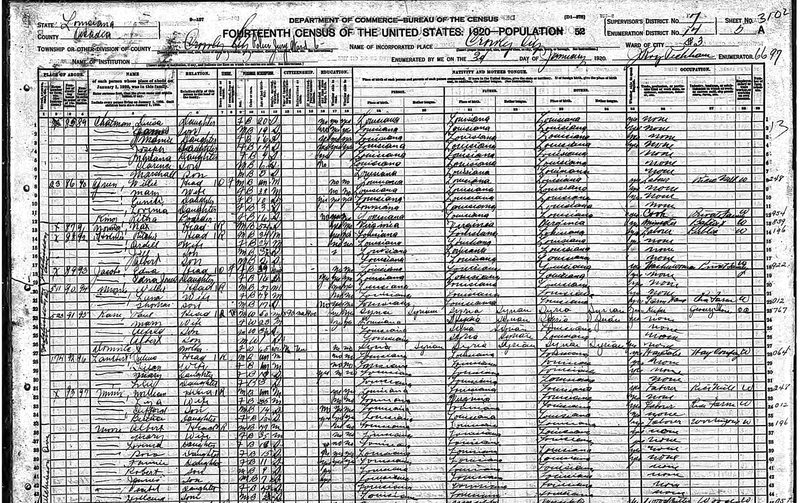 Census Data for 1920 in Crowley City, Acadia County, Louisiana states that Josephine was 14 when census was taken. I was informed by Madlin Senegal that her mother-in-law was born 12/17/1905. Ancestry.com lead me to conclude 1906 earlier. Such a late birthday makes sense though why it seemed that way.